THE STORY - Betrayed by her evil sister Ravenna (Charlize Theron), heartbroken Freya (Emily Blunt) retreats to a northern kingdom to raise an army of huntsmen as her protectors. Gifted with the ability to freeze her enemies in ice, Freya teaches her young soldiers to never fall in love. When Eric (Chris Hemsworth) and fellow warrior Sara defy this rule, the angry queen does whatever she can to stop them. As war between the siblings escalates, Eric and Sara unite with Freya to end Ravenna's wicked reign. We didn't ask for a sequel to "Snow White & The Huntsman." Nor did we need a sequel to "Snow White & The Huntsman." Yet here we are, four years later to a sequel/prequel to "Snow White & The Huntsman," which proves that the studio knew we didn't want nor need a sequel. But clearly they thought so, as it borrows elements from "The Princess Bride," "Game Of Thrones," "The Lord Of The Rings," "The Hunger Games," and especially Disney's own "Frozen." And wouldn't you know it? It's nowhere near as good as any of those listed titles. Taking place before the events of "Snow White & The Huntsman," Freya (Emily Blunt) is betrayed by her evil and jealous sister Ravenna (Charlize Theron). In her despair, Freya unleashes her ice powers and retreats towards the northern part of the kingdom to build an army of emotionless huntsmen. The warriors are forever forbidden to love despite the bond that develops between Eric (Chris Hemsworth) and Sara (Jessica Chastain). Now, years later and past the events of "Snow White & The Huntsman," Eric and Sara set off to destroy the evil mirror used by Ravenna and hope to evade the clutches of the vengeful Freya so that one day they can live in a kingdom where they can continue to love one another without the risk of danger. Clearly an unnecessary cash grab for the studio, "The Huntsman: Winter's War" is convoluted and filled with blandness in almost every area of production. Charlize Theron is back as Ravenna "The Evil Queen," in an improbable fashion that demonstrates clearly why Kristen Stewart did not wish to return to this world. It feels forced and negates the stakes of the previous film. Theron also seems to be phoning it in this time around, where previously her performance was delightfully campy. 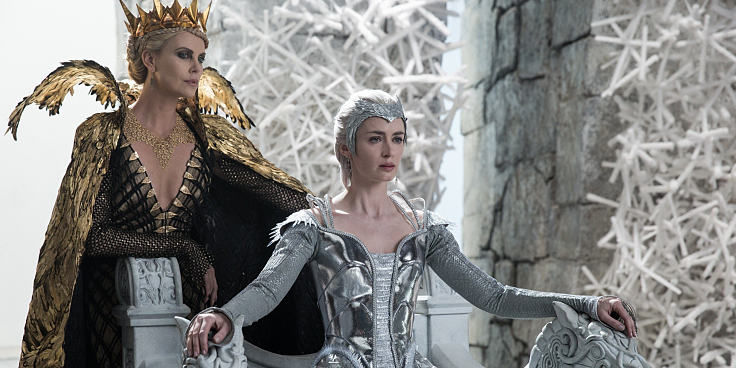 Utterly wasted however is Emily Blunt as Freya, "The Ice Queen." Suffering from the same performance issues as Eddie Redmayne did in "Jupiter Ascending," she is woefully miscast and only serves to put the audience to sleep with her delivery until it becomes blisteringly loud and temporarily wakes us up. Chris Hemsworth and Jessica Chastain fail to ignite a single flame of chemistry between themselves and each fail to deliver authentic Scottish accents. Hemsworth comes off the worst here as his attempts at humor and romance are awkward and dull. Even the child actors cast to play the two romantic leads play their roles better than they do! Nick Frost is the only dwarf from the first film to return and although he does get a few comedic moments, it isn't enough to make up for Hemsworth and Chastain's attempts to ignite humor into this slog of a film. Not quite as visually striking as the first film, "The Huntsman: Winter's War" mostly suffers from its poor directing by former visual effects supervisor on the first film Cedric Nicolas-Troyan and the unnecessarily confusing and misguided screenplay by Evan Spiliotopoulos and Craig Mazin. It's a film that is too dark for kids, yet too frustrating for adults to savor. For the teenage audience that it is clearly catering towards, the film lacks the energy to keep the audience invested throughout its over 2-hour running time. Whether we wanted it or not, "The Huntsman: Winter's War" is here and it is not worth your time. Even the brilliant actresses Charlize Theron and Emily Blunt fail to deliver magnetic performances that could've elevated this film above the score it is receiving from me today. The film lacks the drive and enthusiasm that could've pushed it into at least subpar territory. So with all of that said, save yourself some time and say it loud and clear with me now..."Let it go."